WITH OUR PIMI ZERO FINANCING PROGRAM, YOU CAN REDUCE YOUR ELECTRIC BILL EVERY MONTH WITH A ZEROHOMEBILLS.COM ON- OR OFF-GRID SOLAR SYSTEM. Just fill out the quick form to the right and one of our solar professionals will help you get started today! ZEROhomebills.com also offer a 25 year component warranty on several of the components. By using ZEROhomebills.com as your innovative solar solution, you can benefits from our warranty! 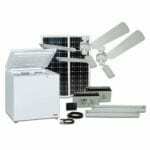 The best solar kits and tailor made solar packages, from the best solar energy product manufacturers at best prices.